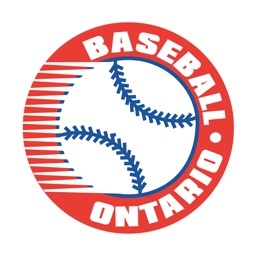 Now supporting 43 State High School and Little League pitch count limit programs! Big Time Coach Pitch Counter is designed to track pitches and innings for players of all ages. As arm injuries increase among youth pitchers, Big Time Coach has developed an application that will help coaches and parents manage the days of rest needed. 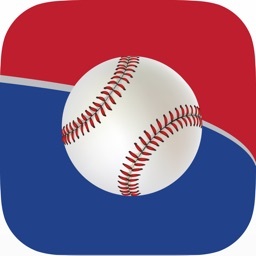 Little League International days rest rules have been incorporated into the app to help coaches become more knowledgeable about the game requirements. 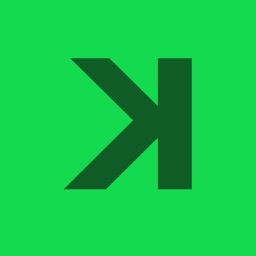 Users may also create custom days rest for tournament play, other youth league rules and the ability to utilize the most current research to best ensure the safety of all youth pitchers. Beyond managing days rest you have the ability to track the number of innings and pitches thrown by player. An often-overlooked aspect of tracking pitches is the number of pitches thrown during a practice or Bull Pen session. These pitches thrown in the practice setting can play a critical role in adding to the risk of arm injuries to pitchers. Big Time Coach Pitch Counter addresses this gap, and provides new insight into the process of pitching, tracking and rest. • Innovative Pitch Counter --- keeps track of balls, strikes, total, pitches, total outs and strike percentage. Current batters count, outs, and runners on base are included to help the coach know the count and assist with pitch selection decisions. • Seeded Days Rest --- thresholds based on Little League Int. and State High School rules cover ages 7 through 18, and can be applied to the Pitch Counter to automatically track the required days of rest. • Custom Days Rest Creation --- ability to set custom days rest rules to meet the needs of tournament play, league rules, rehabilitation and to keep current on the latest medical research. • Player Tracking --- setup players to track pitches thrown in games, bull pens, or any other side session. 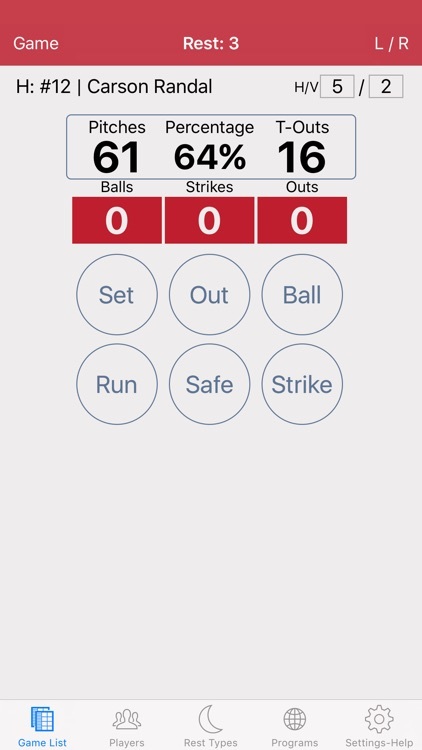 • Simple Bull Pen Counter --- track balls, strikes, total pitches and strike percentage to aid coaches in getting players ready for game situations. 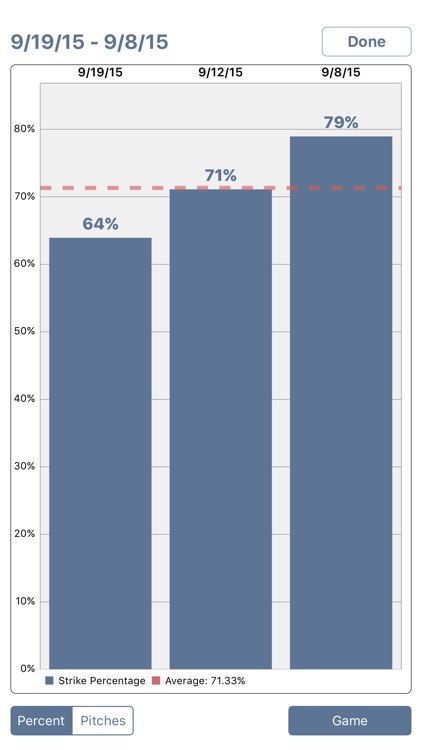 Use the strike percentage to understand when pitchers ready for game situations. • Total Pitch View --- see total number of pitches thrown in the combination of games and bull pens to ensure coaches and parents have the complete view, and understand the impact on player performance. 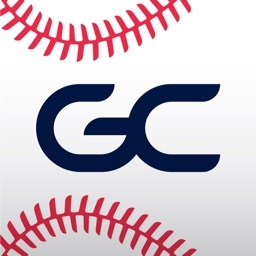 • Import / Export / Email / AirDrop Bull Pens and Game Records --- send bull pen and game information to other coaches or parents who are tracking pitchers rest and performance. 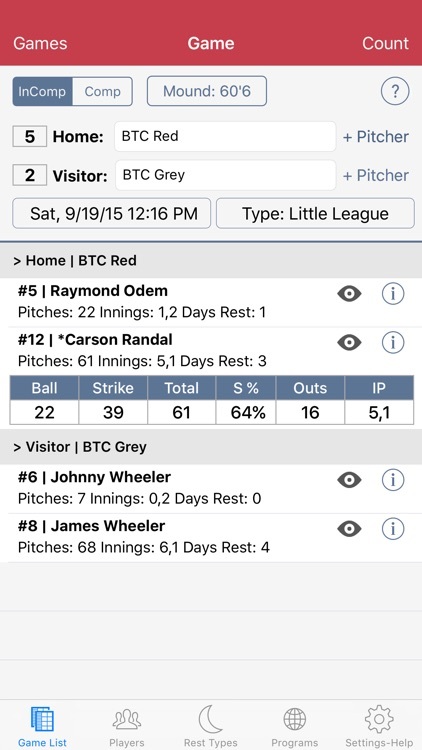 • Game Summary View --- provides a list of all pitchers in a game, total pitches, number of innings and current days rest requirement. Tapping a row provides full detail for the pitchers outing. 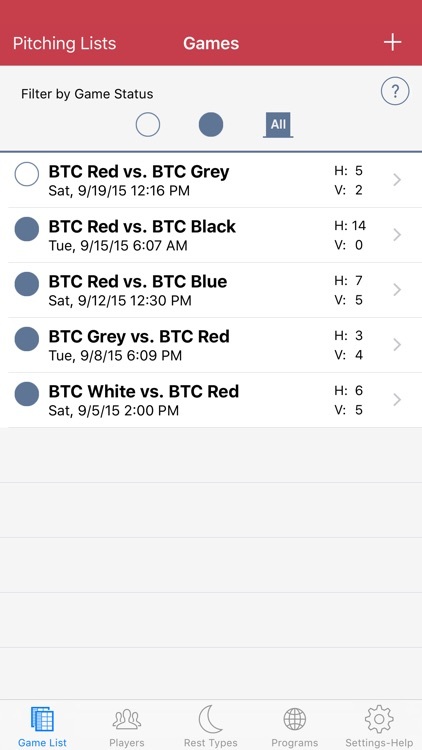 • Track Pitches of Opponents --- in-game tracking to help devise lineup strategies during the game. Track opponent’s pitchers in tournament or league games to make in-game decisions for line-up changes. 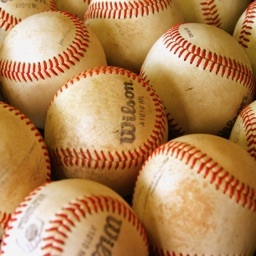 • Pitching Eligibility Tracking --- you may track pitchers eligibility, and gather signatures right at the field. Export the pitching eligibility form and the signatures are included, or use Eligibility Detail for time stamped signatures. Includes "Threshold" counts. 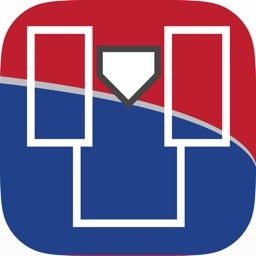 • Estimated Pitch Speed Calculator --- Check pitch speed during games and bull pens. Keep history of top pitch speed for bull pens. • Pitch Fact Graphs -- review graphs of pitching percentages and pitching totals for each player along with average and goal thresholds. • Use Spotlight to Search for Pitchers by name to view game and total pitching records. • AirDrop games, bull pens, and players to team staff and parents. • Team Snap and SportsEngine® Integration!